Retail customers are now “omnichannel” in their outlook and behavior — they use both online and offline retail channels readily. To thrive in this new environment, retailers of all types should reexamine their strategies for delivering information and products to customers. Paula Cuneo, a teacher in Ashland, Massachusetts, ordered 10 pairs of corduroy pants in a range of sizes and colors from Gap Inc.’s website, and later returned seven of them, according to a 2013 Wall Street Journal article.1 Ms. Cuneo is, perhaps unwittingly, an exemplar of a key challenge in today’s omnichannel retail environment — an environment where customers shop through a variety of online and offline channels. The challenge omnichannel retailers face is this: How can retailers provide consumers with information (about what products best suit them) without incurring downside on product fulfillment (delivery of products)? The omnichannel environment presents new challenges and opportunities for both information and product fulfillment. This is equally true for “traditional” retailers like the Gap, which began business with physical stores, and “new” retailers like New York-based eyeglasses brand Warby Parker, which started out by selling online. While all retailers need to effectively and efficiently manage fulfillment and information provision, there are important nuances to how this happens — depending on where and how the retailer got started and what kinds of improvement create the most leverage. This article delivers a customer-focused framework showing how to win in the omni-channel environment through critical innovations in information delivery and product fulfillment. The framework emerged from our research with both traditional and nontraditional retailers. To thrive in the new environment, retailers of all stripes and origins need to deploy information and fulfillment strategies that reduce friction in every phase of the buying process. This means simultaneously providing, in a cost-effective and narrative-enhancing way, information that removes initial uncertainties and barriers to purchase — as well as fulfillment options that allow retailers to get their products to customers in the most convenient and cost-effective way. Our research relies on detailed customer-behavior data (such as visits, purchases and returns) from omnichannel retailers. We then used these data to perform statistical tests of the impact of management interventions (such as website enhancements and showroom openings) on overall demand and fulfillment efficiency. (See “About the Research.”) We explain why the best way to navigate the omnichannel environment is to: (1) take a customer perspective and (2) view the activities of the company through the lens of the two core functions of information and fulfillment. Last, and most important, we elaborate on each of the core elements of our information and fulfillment matrix in detail and highlight the key implications for omnichannel retail practice. We conducted our academic research on omnichannel issues by using large customer databases from Crate & Barrel, Bonobos.com and WarbyParker.com and supplementing them with other data from external public sources as necessary (discussed below). We worked closely with executives to elaborate research issues that were not only of theoretical or academic interest but also of practical economic importance to retailers. When it comes to fulfillment, customers either visit the store to pick up items or the “store comes to them” when products are delivered. This is true with information, too, as customers either visit stores to obtain (offline) information or seek information remotely, either online or perhaps through catalogs. Prior to the advent of the Internet, there were really only two generic types of retailers. The first type was traditional retailers, indicated by the upper-left quadrant in our matrix (quadrant 1), wherein all product information is delivered offline through physical stores, and customers visit stores to take fulfillment. Many retailers still operate exclusively in this quadrant, as exemplified by Ross Stores or HomeGoods. The second type was catalog retailers, which can be considered an early precursor to today’s pure-play online retailers (quadrant 4), in which information is delivered directly to customers via the Internet (instead of a catalog) and product fulfillment takes place via delivery. The development of the commercial Internet spurred growth in the number of pure-play Internet retail companies (quadrant 4), with online transmission of information and fulfillment via delivery, as exemplified by Amazon.com or Overstock.com. The great promise of the “omnichannel revolution,” however, lies not simply in the new retail businesses made possible by Internet connectivity, but also more subtly and profoundly in the emergence of the retail strategies located in quadrants 2 and 3. 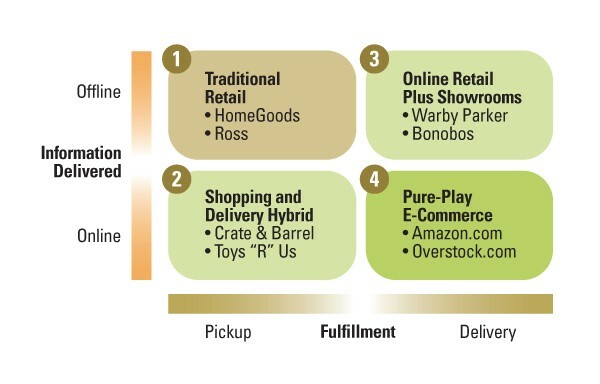 One observation immediately apparent from our information and fulfillment matrix is that a retailer has the potential to operate in any of the four quadrants. However, to develop intuition for what kinds of combinations of information delivery and fulfillment will succeed for what kinds of businesses and why, it helps to first focus on the exemplar cases for quadrants 1 and 4 and think about the products and experiences for which they excel. In an omnichannel retail environment, customers can either visit stores to obtain information, or they can seek information remotely. They can also either visit a store to pick up items, or the store can “come to them” when products are delivered. Nevertheless, it is natural and most likely imperative for most traditional retailers to participate in quadrant 4 and build an e-commerce operation. Quadrant 4 retailing is growing at a rapid pace, both within the United States and abroad.4 We predict that the “synchronized” experiences of quadrant 1 and quadrant 4 activities — where information and fulfillment activities are accomplished in the same channel — will continue to anchor retail and that new players will start businesses in either quadrant, but that new players’ operations will be greatly enhanced by strategies and activities that fall in quadrants 2 and 3. This is due to the opportunities that arise from decoupling the information and fulfillment dimensions of quadrants 1 and 4. Let’s start by looking at the information dimension. When retailers operate in online quadrants (2 and 4), this dictates that they give customers information about the products through some remote means, such as a catalog or a website. This form of information delivery is most suited to products containing few, if any, “nondigital” attributes.5 A nondigital attribute — for example, the fit and feel of apparel and related categories or the taste and texture of products — is difficult to fully observe and assess without a physical inspection. Uncertainty about nondigital attributes is a key barrier to consumers’ willingness to buy online and is an especially important deterrent for first-time online purchases.6 Once a consumer has experience with a brand or product, he or she may be willing to rely on purely online information for subsequent online purchases. Conversely, when companies operate in the upper “offline” quadrants (1 and 3), they give customers direct access to product information via physical access to products. This method of information delivery is especially well-suited to retailing products that have significant “high-touch” elements, important service requirements or significant nondigital attributes. In fact, it is this very same point of strength of quadrant 1 retailing that makes retailers who only operate there especially vulnerable to consumers “showrooming” — examining merchandise onsite but purchasing at a lower price online.7 Mitigation or elimination of showrooming is a vital management objective for traditional retailers.8 It is highly detrimental to the showroomed retailer if the consumer, after appropriating the information from that retailer, buys online from a competitor. Thus, if quadrant 4 is well suited to selling products for which customers either have a fair degree of certainty about what to expect or can expect only limited value from a live customer-service experience, and quadrant 1 is well suited to high-touch products yet highly vulnerable to showrooming, this raises intriguing possibilities for hybrid experiences (quadrants 2 and 3). They can both enhance the customer experience and improve performance outcomes for retailers. From the retailer’s point of view, fulfilling orders in stores (quadrants 1 and 2) or via delivery (quadrants 3 and 4) pose very different challenges. When orders are fulfilled in stores, there are important location and store-design decisions to be made. Stores have to be accessible to customers and large enough to hold inventory. These constraints can translate into significant real estate costs. Furthermore, in order to fulfill transactions in stores, the retailer must carry the right products in the right stores at the right time. In order to do that, the company has to decide which products to carry in each brick-and-mortar retail location and also accurately forecast demand for each product and store — something that is notably harder to do on a per-store basis than at a higher level of aggregation.10 Higher demand uncertainty at the store level results in higher supply-mismatch costs, which are then manifested through excess inventory or lost sales due to products being out of stock. 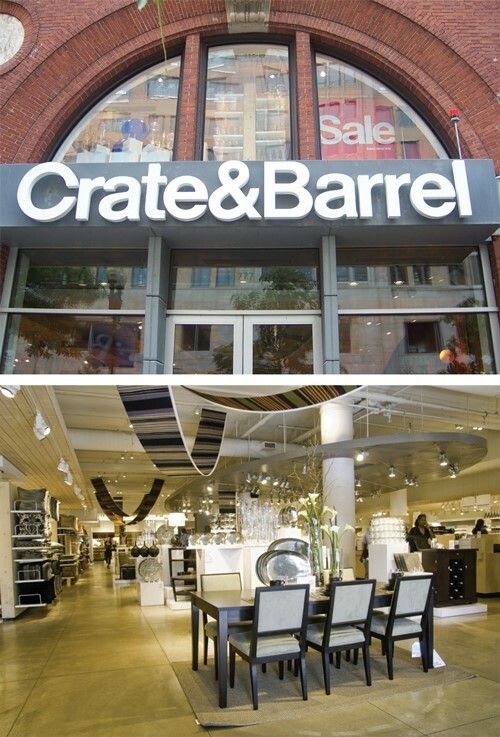 Crate & Barrel has numerous stores located in the United States and Canada, and the BOPS option was offered to shoppers in the United States only. To isolate the impact of BOPS, we looked for differences in shopper behavior (for example, sales levels for a particular product category or overall store traffic) between the two countries.14Since we controlled for other differences between the United States and Canadian stores, we could attribute any remaining differences in sales and store traffic to the availability of the BOPS option. There are two reasons why BOPS, in theory, offers shoppers a compelling value proposition. First, they can very easily get accurate information about prices and availability of items that they are interested in buying before placing their order. Second, since they can pick the item up, they get gratification from immediate access to the purchased product. Thus, BOPS eliminates a critical search friction for shoppers — wondering whether a particular item is available in a store and what it costs. BOPS also counters a key deficiency of the online shopping experience — waiting for purchased items to be delivered. In a very real sense, BOPS gives shoppers the best of both worlds — full information delivered before purchase (no search friction) and immediate fulfillment (no waiting for delivery). Management’s expectation was that post-BOPS, online sales in the United States would increase. Surprisingly, that didn’t happen. In fact, online sales went down, even though traffic to the website went up. To understand why, note that most of the items sold at Crate & Barrel have nondigital, “touch-and-feel” attributes that are hard to communicate online. Hence, even though BOPS allowed shoppers to fully resolve uncertainty about price and availability prior to shopping, it did not allow them to resolve uncertainty about products’ nondigital attributes. Nevertheless, overall sales at the stores went up. Shoppers, having confirmed that the products they wanted were in stock and appropriately priced, went to the store to inspect and buy. BOPS removed search friction for information that can be efficiently communicated online (price and in-stock position) and eliminated post-purchase waiting time. The online purchase option could not, however, help customers eliminate uncertainty about nondigital attributes. A variant of the BOPS shopping process is ROPO (“research online, purchase offline”), or “reverse showrooming.” For instance, traditional retailers that commit to providing accurate price and inventory information online, and that otherwise engage customers effectively online as well, can see increased traffic and sales in their physical stores. Furthermore, in our experience, both BOPS and ROPO customers can, after visiting the store in person, generate incremental sales in product categories other than the one(s) that drove the initial visit. Furniture and housewares retailer Crate & Barrel was able to drive economically significant offline increases in traffic and sales by providing accurate price and inventory information online. If it makes sense for Crate & Barrel to “move down” from quadrant 1 into quadrant 2 and start providing a richer online-information experience, it may also make sense for Warby Parker (and other initially pure-play Internet retailers) to expand from quadrant 4 into quadrant 3. As we noted earlier, for products that require service and/or have high number of touch-and-feel components, offline delivery of product information is likely to be valued by customers. There might be other benefits as well, including an increase in brand awareness and positive reinforcement of the brand’s legitimacy. Inventory-only showrooms are third-party locations (typically stores that sell apparel and accessories) that display the full line of Warby Parker frames. Customers can visit these stores, such as the partner showroom in Old City in Philadelphia, try the frames on and then have the product fulfilled via delivery just as if they had ordered online. The inventory-only showroom is an example of quadrant 3, as information is delivered offline, but product sales are fulfilled via delivery. We wanted to understand the impact of these inventory-only showrooms on demand, brand awareness and product returns. To assess any potential marketing and operational efficiency benefits of this hybrid experience, we defined a “trading area” for the showroom (typically a 30-mile radius around the showroom) and analyzed the “natural experiment” created when showrooms were opened. Our regression analyses highlighted several benefits of Warby Parker’s showrooms. First, and perhaps not too surprising, total sales increased about 9% in the locations within the trading area of the showrooms. (Remember, this increase is relative to other locations that are “matched” in other ways but that do not have a showroom.) The company was able to expand its sales by providing information offline. Next, we found that website sales that had their origin in the showroom trading area (as measured by the ZIP code) increased significantly, too, by about 3.5%. An offline showroom thus appears to confer awareness and brand-legitimacy benefits such that new customers show up in the online channel. For the sampling channel, or Home Try-On program, we analyzed not only sales but also the number of customers who tried the program. After the showroom opened, sales through this channel decreased by 5.5% and the total number of customers trying the sampling program declined by 8%. So, while this channel now generated fewer sales, it became more efficient as the conversion from ordering try-ons to actual purchases increased significantly. Product information gets delivered to potential customers not just by a retailer but also by other customers of that retailer. Managers need to recognize the importance of variation in physical geography and types of offline environments. Prior research has shown that online sales of commodity products vary significantly with variations in real-world factors, such as population density and access to stores.21 But we found an equally important impact on products with nondigital attributes. This was reinforced through work we did with Bonobos.com, a men’s fashion brand with e-commerce as its core distribution channel. Bonobos, like Warby Parker, began life in quadrant 4 as a pure-play online retailer and later developed so-called offline “guideshops.” These relatively small (typically about 1,200 square feet), high-service locations provide sufficient inventory for the customer to try on, but not to buy at the store and take home immediately. That is, they utilize online fulfillment in the same way that Warby Parker showrooms do.22This quadrant 3 strategy has been highly effective for Bonobos, and aggressive expansion is planned.23 Moreover, several Bonobos items are available in Nordstrom department stores throughout the United States, and this traditional, quadrant 1 retailing has been important for Bonobos’ growth. As noted above, physical locations with “better” offline information transmission between existing and potential customers have higher online sales. Moreover, in physical locations with offline showrooms, retailers can benefit from lower rates of returned products. These important informational benefits translate to the online world, as we have also found that online sites with better information delivery can reduce product returns. “Fitting rooms” placed on websites are one potential antidote to the returns problem. Specifically, these are technologies that provide online customers with accurate fit information and size recommendations in advance of any buying decision. In an ongoing research project with the virtual-fitting-room technology company Metail,30 we explored whether the richer information delivered online with those type of tools results in higher sales and lower returns. To conduct our tests, we randomly assigned customers from a large online apparel retailer to one of two conditions: They either had access to the Metail virtual fitting tool, or they did not. We found that customers with access to the virtual fitting tool had higher conversion rates and lower return rates than those customers without access to it. Thus, higher-quality personalized information, even if delivered through an online channel, is a potentially powerful ally in one of most important battles in omnichannel retailing — namely, the fight to bring down product return rates. In a 2013 article in MIT Sloan Management Review, researchers Erik Brynjolfsson, Yu Jeffrey Hu and Mohammad S. Raman predicted: “As the retailing industry evolves toward a seamless ‘omnichannel retailing’ experience, the distinctions between physical and online will vanish, turning the world into a showroom without walls.”31We concur and think our article provides sellers with a framework for navigating this landscape. We began this article describing a shopping process in which a customer undermined the efficiency of a company’s existing information and fulfillment methods in order to get exactly what she wanted. The drive for a solution to such inefficiencies promoted the development of our information and fulfillment matrix — a customer-focused framework for articulating how information should be delivered (online or offline) and how demand should be filled (pickup or delivery). We showed that a traditional retailer such as Crate & Barrel can realize considerable gains by improving its online information about nondigital attributes of products. This gives the customer a reason and willingness to interact with the retailer outside the store environment and to initiate and partially complete a transaction online before entering the store and finishing it. By providing accurate price and inventory information online, the retailer was able to drive economically significant offline increases in traffic and sales. Similarly, we demonstrated that an online-first retailer like Warby Parker can experience substantial benefits from an offline presence that simply showcases inventory. Offline showrooms deliver economically significant impacts on sales, returns, awareness and sampling efficiency in locations within the showrooms’ trading areas. Furthermore, customers are able to choose the channel that best fits their needs, with those customers wanting to touch and feel before buying most likely to visit the showroom. Like it or not, customers are omnichannel in their thinking and behavior. Sellers need to be as well. Omnichannel features initially perceived as “nice add-ons” are becoming “must-haves.” The question for sellers is no longer whether to operate an omnichannel strategy, but how to implement it most effectively. Our research underscores that the best sellers will win the omnichannel revolution by working across the permeable boundaries of information and fulfillment, offering the right combination of experiences for the customers that demand them. S. Banjo, “Rampant Returns Plague E-Retailers,” Wall Street Journal, Dec. 22, 2013. As Andy Dunn, founder and CEO of men’s clothing brand Bonobos, has written, “At the end of the day, you’re not building an e-commerce company, you’re building a brand that has e-commerce as its core distribution channel. The difference is subtle but momentous.” See A. Dunn, “E-Commerce Is a Bear,” May 20, 2013, http://medium.com. “eCommerce Disruption: A Global Theme — Transforming Traditional Retail,” white paper, Morgan Stanley Research, New York, January 6, 2013. “Alibaba: The World’s Greatest Bazaar,” Economist, March 23, 2013. The important distinction between digital and nondigital attributes was introduced to the academic literature in R. Lal and M. Sarvary, “When and How Is the Internet Likely to Decrease Price Competition?,” Marketing Science 18, no. 4 (November 1999): 485-503. See, for example, A.M. Degeratu, A. Rangaswamy and J. Wu, “Consumer Choice Behavior in Online and Traditional Supermarkets: The Effects of Brand Name, Price and Other Search Attributes,” International Journal of Research in Marketing 17, no. 1 (March 2000): 55-78; and J.Y. Lee and D.R. Bell, “Neighborhood Social Capital and Social Learning for Experience Attributes of Products,” Marketing Science 32, no. 6 (November-December 2013): 960-976. This practice has drawn the ire of retailers. See, for example, D. Coleman, “Showrooming Is the New Shoplifting,” May 24, 2013, http://www.retailers.com. Showrooming, by some industry estimates, is thought to cost U.S. retailers more than $200 billion. See “Showrooming: A $217 Billion Problem,” May 2013, http://www.360pi.com. The Internet retailer as a purveyor of “infinite” product variety was probably first popularized in C. Anderson, “The Long Tail: Why the Future of Business Is Selling Less of More” (New York: Hyperion, 2006). Academic research has also shown that Internet shoppers are more likely to buy niche products; see E. Brynjolfsson, Y.J. Hu and M.S. Rahman, “Battle of the Retail Channels: How Product Selection and Geography Drive Cross-Channel Competition,” Management Science 55, no. 11 (November 2009): 1755-1765. For the former, see M. Fisher and R. Vaidyanathan, “Which Products Should You Stock?” Harvard Business Review 90, no. 11 (November 2012): 108-118. Aggregating inventory decisions for n independent locations (or, more generally, demand streams) results in lower relative uncertainty and lower inventory costs, as demonstrated in G.D. Eppen, “Note: Effects of Centralization on Expected Costs in a Multi-Location Newsboy Problem,” Management Science 25, no. 5 (May 1979): 498-501. The cost of holding inventory at a distribution center is lower than the cost of holding inventory at a store. Excluding shipping costs, it is usually substantially less expensive to operate a system with centralized fulfillment than a system that holds inventory in each store. For example, business researchers Antonio Moreno and Christian Terwiesch show that as automotive companies increase the number of products they carry, the supply-demand mismatches increase, and negative effects of uncertainty become more important. When automotive manufacturers extend their product lines, they have to carry more inventories and offer higher discounts. See A. Moreno and C. Terwiesch, “The Effects of Product Line Breadth: Evidence from the Automotive Industry,” April 7, 2013, http://papers.ssrn.com. More recently, some companies have incorporated similar programs in which the product bought online does not need to physically be in the store at the moment of purchase. It is shipped to the store after the customer completes the purchase. We call such programs “buy online, ship to store” (BOSS). S. Gallino and A. Moreno, “Integration of Online and Offline Channels in Retail: The Impact of Sharing Reliable Inventory Availability Information,” Management Science 60, no. 6 (June 2014): 1434-1451. This innovation earned WarbyParker.com the moniker “the Netflix of eyewear.” See D. Wong, “GQ Calls It the Netflix of Eyewear,” Nov. 29, 2010, http://www.huffingtonpost.com. In experiments, the proper “matching” of treatment and control cities is very important, and in typical cases it is accomplished by random assignment of essentially identical experimental units or subjects to either the treatment or the control condition. Clearly, however, Warby Parker management does not open showrooms in random locations but in locations where they expect to see the greatest benefit. Any assessment of showroom impact needs to factor this endogeneity into the analysis. We account for it using propensity scoring. See F. Caro and C. Tang, “The 1st POMS Applied Research Challenge 2014 Awards,” Production and Operations Management, in press. We also conjecture that when a company can effectively deliver customer experiences that lead to early purchases through an offline channel, for example by providing outstanding service in a store, an inventory-only showroom or even a pop-up store, this can allow the company to subsequently retain and service these customers via the online channel — essentially acquiring the customer through either quadrant 1 or quadrant 3 and retaining and maintaining the customer through quadrant 4. We thank Lawrence Lenihan for this observation. Authors’ communication with Lawrence Lenihan, cofounder and managing director, FirstMark Capital, March 27, 2014. Other successful online-first retail players are going into this retail format, including dress and accessory rental company Rent the Runway. See A. Jacobs, “Ready to Strut in Ready-to-Rent,” New York Times, January 22, 2014; and E. Brooke, “Rent The Runway Branches Further Offline, With A Showroom at Henri Bendel,” TechCrunch, October 17, 2013 (see http://techcrunch.com/2013/10/17/rent-the-runway-branches-further-offline-with-a-permanent-showroom-at-henri-bendel/). For details and routes, see “Warby Parker Class Trip,” n.d., http://www.warbyparkerclasstrip.com. See http://www.thestorefront.com; and J.D. Stein, “No Space Too Small, No Lease Too Short,” New York Times, December 20, 2013. See, for example, J. Choi, D.R. Bell and L.M. Lodish, “Traditional and IS-Enabled Customer Acquisition on the Internet,” Management Science 58, no. 4 (April 2012): 754-769. See M. Halkias, “E-commerce Retailers Open Physical Locations in Dallas to Augment Online Stores,” Dallas News, June 4, 2014. For more details, see S. Jacobs, “Bonobos, an Ecommerce Darling, Finds an Edge in Brick and Mortar,” May 30, 2014, http://streetfightmag.com. This was popularized in R. Putnam, “Bowling Alone: The Collapse and Revival of American Community” (New York: Simon and Schuster, 2000). Documentation that comes with the SCCBS describes it as the “first attempt at widespread systematic measurement of social capital in the United States,” and it has been used extensively in economics. See M.B. Aguilera, “The Impact of Social Capital on Labor Force Participation: Evidence From the 2000 Social Capital Community Benchmark Survey,” Social Science Quarterly 83, no. 3 (September 2002): 853-874; and C.A.L. Hilber, “New Housing Supply and the Dilution of Social Capital,” Journal of Urban Economics 67, no. 3 (May 2010): 419-437. While not tested directly, the converse is implied by our research as well — that if customer experiences are negative, then online sales will slow down more rapidly in locations with more offline social capital. For details, see Lee and Bell, “Neighborhood Social Capital and Social Learning,” 973. Banjo, “Rampant Returns Plague E-Retailers”; and “E-Commerce Returns Are Up,” Fox Business video, 03:21, December 23, 2013, http://video.foxbusiness.com. Metail, headquartered in London, allows female shoppers to create a 3-D model of themselves and evaluate how products would fit them prior to making an online purchase. Other companies providing similar tools to apparel and footwear retailers include PhiSix Fashion Labs, which eBay acquired in February 2014, and Pittsburgh-based Shoefitr. E. Byrnjolfsson, Y. Hu and M. Raman, “Competing in the Age of Omnichannel Retailing,” MIT Sloan Management Review 54, no. 4 (summer 2013): 23-29. For more details, see D.R. Bell, J. Choi and L. Lodish, “What Matters Most in Internet Retailing,” MIT Sloan Management Review 54, no. 1 (fall 2012): 27-33. David R. Bell is the Xinmei Zhang and Yongge Dai Professor and professor of marketing at the Wharton School at the University of Pennsylvania in Philadelphia, Pennsylvania. Santiago Gallino is an assistant professor of business administration at the Tuck School of Business at Dartmouth College in Hanover, New Hampshire. Antonio Moreno is an assistant professor of managerial economics and decision sciences at the Kellogg School of Management at Northwestern University in Evanston, Illinois. More Than a Feeling! How to Inspire True Customer Loyalty.